If you'd ever traveled with the Minnesota Orchestra on tour, you would have witnessed a scene like this: Two classical musicians sit down with a classroom of a few dozen students, most of them holding instruments. "We want to say welcome. We have Miss Pam and Mister Richard. I believe they are going to play for us," says the teacher. Violinist Pamela Arnstein and violist Richard Marshall speak a bit, and then Marshall plays a little Bach. The students sit and soak it in. This time, though, the musicians are not visiting Cuba or South Africa. The classroom is in Ascension Catholic School, in north Minneapolis. The visit is one of about a dozen events this week in schools, churches, community centers, and even a barbershop, all on the north side of Minneapolis. It's part of an effort that began almost three years ago with a quickly arranged Christmas concert. Minnesota Orchestra general manager Beth Kellar-Long and MacPhail teaching artist L.A. Buckner have been working together since the orchestra played that concert at Shiloh Temple in north Minneapolis. The orchestra was bouncing back after the bruising 16-month labor lockout, and looking for ways to connect with the community. 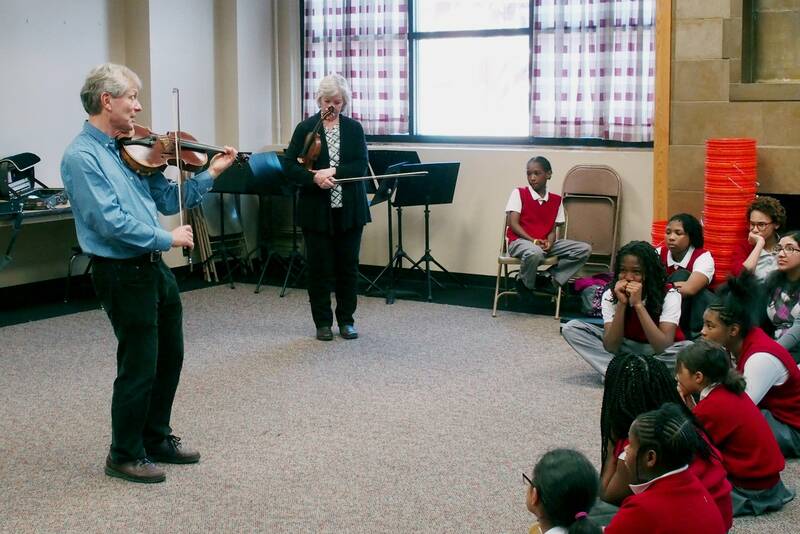 After doing a series of smaller events, and having musicians visit schools and teach, the orchestra and the community advisory board decided to offer a weeklong residency under the orchestra's Common Chords program. Buckner said people initially didn't quite know what to expect. "The community was pretty receptive of the idea," he said. "We didn't know how it was going to happen, but here we are." Musicians had visited outstate communities through the Common Chords program. Kellar-Long said a visit closer to home offers advantages. "One of the things with the outstate Common Chords is, to have the orchestra go there for a whole week, that's a long time. 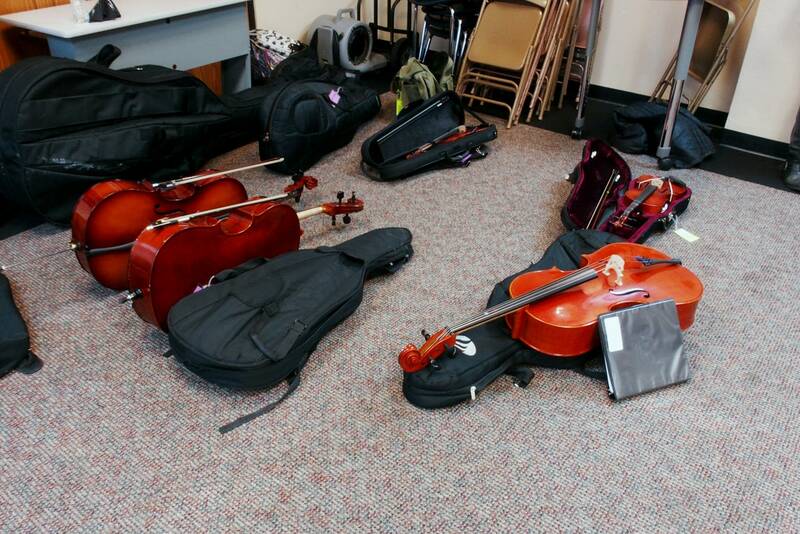 So usually we start with some small groups, and then the whole orchestra comes," Kellar-Long said. "But of course, with staying in the Twin Cities, we've got the whole orchestra the whole week." Which is where the visit to Ascension Catholic School comes in. After playing and answering student questions Richard Marshall and Pamela Arnstein led smaller group classes. For the violinists with Arnstein, that included practicing bow technique, and even playing badly together in a discussion of tonality. "Now listen to the group sound," Arnstein told the group. "OK, stop! That is the sound of a full parking lot at Walmart with everyone honking their horns. That is so NOT a beautiful sound!" 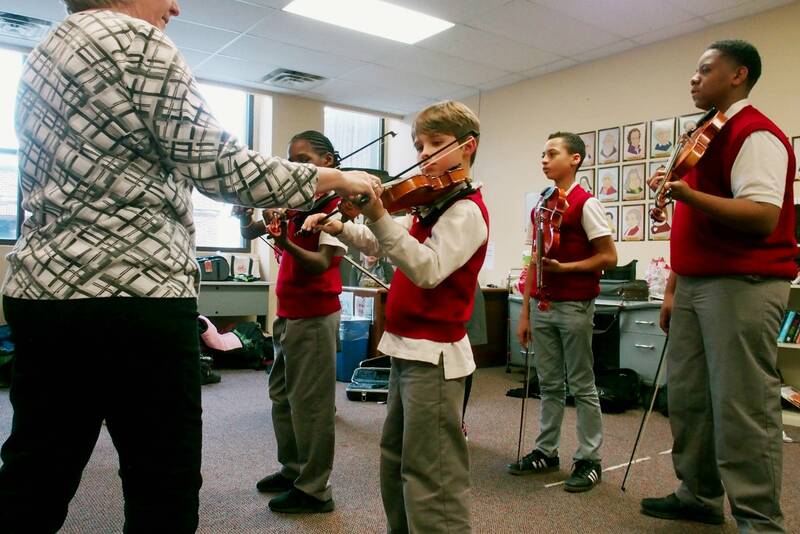 Some of the Ascension students will play with the full orchestra at North High Saturday night. The event is free to North Minneapolis residents, who are asked to register for tickets in advance. One of the pieces will be "We Shall Overcome," arranged by Buckner and Dean Sorenson. It will include north side students bucket drumming as led by Buckner. He's been using the drumming as a way to get youngsters interested in music, and now in Common Chords. He hopes the community will be excited too. "There are some thoughts of 'I wonder what is going to happen? I wonder if the turnout will be what we want, or I wonder who is going to show up?' Because you think of the north side of Minneapolis and classical music, it's almost an oxymoron," he said. But there is a deep musical appreciation on the north side, he said, and people will turn out. Many came to the community dinner and performance Tuesday, where even conductor Osmo Vanska joined the bucket drumming. Violist Richard Marshall said it's the musicians who are learning when they play outside Orchestra Hall. He said he wants the Minnesota Orchestra to truly be that: an orchestra with a connection to the whole state. "We have a great, great, great responsibility," he said, "but also great opportunity, shall we say, to really mirror what we need to mirror and become greater and better. We have to reach more people." Marshall said he hopes to teach regularly in north side schools after Common Chords wraps up.